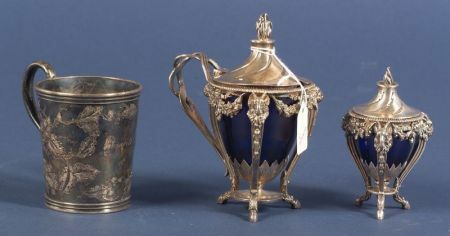 Two Dutch Silver Condiment Jars with Cobalt Glass Liners, .934 fine, date marked 1897, comprising a caster, and a lidded mustard pot, both vasiform, with peaked lids with flame finials, on three ram monopodia conjoined by floral and ribbon-tied swags, the mustard pot with entwined reeded handle, ht. 6 and 4 1/4 respectively, approx. 14 troy oz. 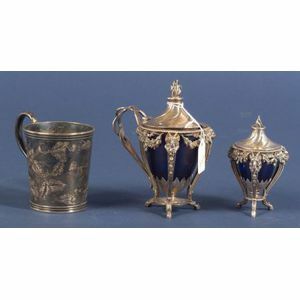 ; sold together with a Bigelow, Bros. & Kennard, Boston, coin silver mug with chased and embossed acorn branches, engraved with name, ht. 4 in., approx. 4 troy oz., (3 items total).